Welcome to Dominique Hogue's Railroad Picture Archives! Welcome to the RRPictureArchives.NET contributor site of Dominique Hogue. Hello and welcome to my photo page! 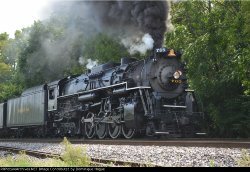 Here is the wide variety of railroad photography I have done in recent years.From steam to diesel, passenger to freight, shortline to mainline.You will find about everything you'd want here. I do take input on my photos and videos on my youtube channel ( www.youtube.com/rockinrailroader765 ).I also take request and ideas on future projects.So drop me a coment or message and we'll talk!